And we are making progress! I'm working from the top down, which means we're at the halfway mark for the interior finishes! 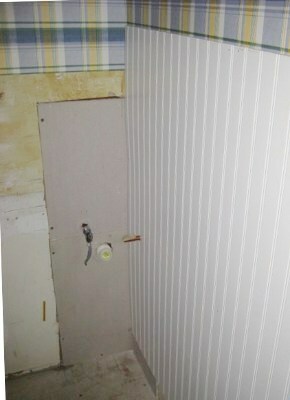 The next step after the wallpaper, was the wainscoting. I want wainscoting to cover the lower half of three of the bathroom walls to visually brighten this small room, and provide to a backsplash of sorts for the corner sink. The commercial wainscoting available locally is chair rail height, 36 inches. I really wanted it a little taller than that, so Dan made ours from 4x8 foot bead board panels. These were cut in half for a 48 inch tall wainscoting. At that height however, we had some challenges to deal with. There were a number of workarounds for these, but since height is arbitrary, we decided to let our "problem areas" determine exactly how tall our wainscoting would be. 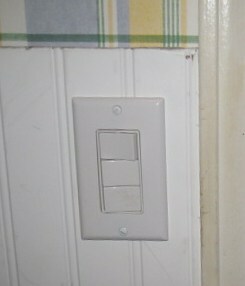 One of those areas was the light switch. 48 inches split the switchplate in half, which meant more cutting and fitting for the wainscoting trim. Not that this wasn't possible, but with so many projects vying for our attention, we're learning to make decisions based on resource availability. By that I particularly mean time, energy, and money. We could go for the fanciest results, or the cheapest, or something in between. When we first bought the place, we were filled with ambitions of true period restoration. Then reality sank in. Perhaps if the house were the only thing we have to do, it would be possible. But it isn't. We want a comfortable, aesthetic, somewhat updated home, but especially we want a homestead. That means we have to make choices about the house they are in line with those goals. The easiest way to deal with the switch plate was to put the wainscoting higher, than 48", to allow the trim to just clear the switch plate. 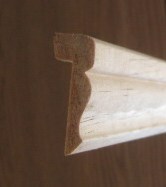 The trim itself (right), is panel moulding. It has a lip on the back which fits over the top of the paneling, giving the whole thing a nice, finished appearance. We could have special ordered wainscoting top and bottom moulding, but figured the convenience wasn't worth the expense. 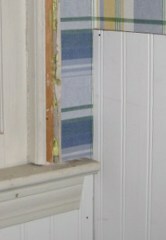 Raising the height of the wainscoting however, leaves a gap at the bottom. This will be easily remedied with baseboard moulding. After the wainscoting is up, we'll lay the tile floor and then choose a moulding to cover the gap. 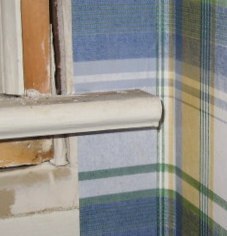 Another "problem" area was the small space in this window corner. My original idea called for wainscoting going around this corner to cover both walls. 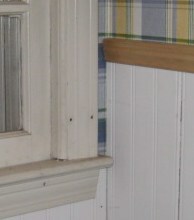 The window sill though is 44.5 inches from the floor and well below the top of the wainscoting. After installing the wainscoting on the right hand wall, the corner looked like the photo lower right. The question about how to treat the small space between the corner and the window was pause for consideration. 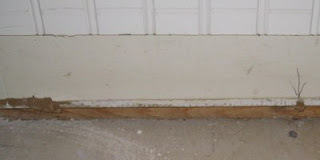 We decided to put the window trim and panel moulding up and see how it looked then. I have left the wainscoting on two walls only and simply have papered all the way under the window? Should I have insisted that DH do some fancy woodworking for a 1 inch gap on the wall? Will anyone notice from a galloping horse? Look'n good! Happy things are coming along and your space will be perfect just for the two of you! Looking brilliant - well done. I think that the window area looks just fine. I rather like the way that the bit of wallpaper makes the window stand out a bit more. Very pretty combination with the wainscotting bead board, the white and the wallpaper. It is looking great. You seem to have every step planned well. I cannot wait to see it finished. Of course so are you...lol! Mama Pea, I know we're not supposed to point out things we don't like about our projects. I'm counting on what you said, that no one will even notice. :) All in all, we're happy with the way it's looking so far. Dani, I enjoy watching those of you down under in the garden. :) For us, it's all inside now, just as you say. Nina thanks! I think it will look really nice once all the trim is up and I can paint it all a clean, matching white. It's a relief to see it turning out like I've been hoping it would. Toodie, well, we think we have it carefully planned until we run into a glitch! LOL. Yes, I'm anxious for it to be finished. Galluping horse or not, I think it looks fantastic! I love the plaid too by the way! little fool the eye trick and paint it to look like wainscotting and a small piece of wood cap glued above. Chances are no one will ever notice either way. I think it looks just fine the way it is and I doubt if anyone will think it should have been different. Those little details will only bother you. It looks just right. You know that we artists are our own worst critics! My suggestion is to look at it upside down/from a distance/in a mirror, in order to trick your mind into seeing it afresh.